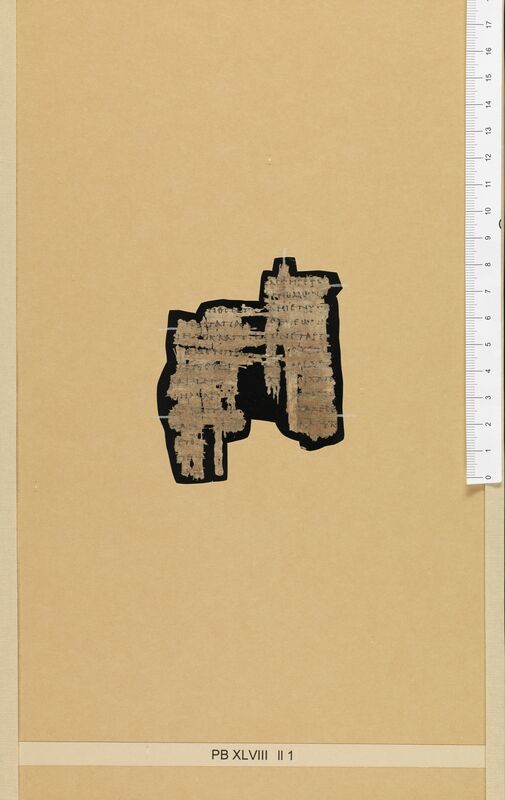 Description: Two small fragments of papyrus containing lines 45-58 of the first book of the Iliad copied along the fibers (→). The back of the papyrus (↓) is blank. The maximum preserved height of the fragment is 8.2 cm; the maximum preserved width is 6.5 cm. Hurst suspected that this papyrus was acquired by Bodmer before his purchase of the “Bodmer papyri” proper (Hurst, “Papyrus Bodmer 48,” 30). 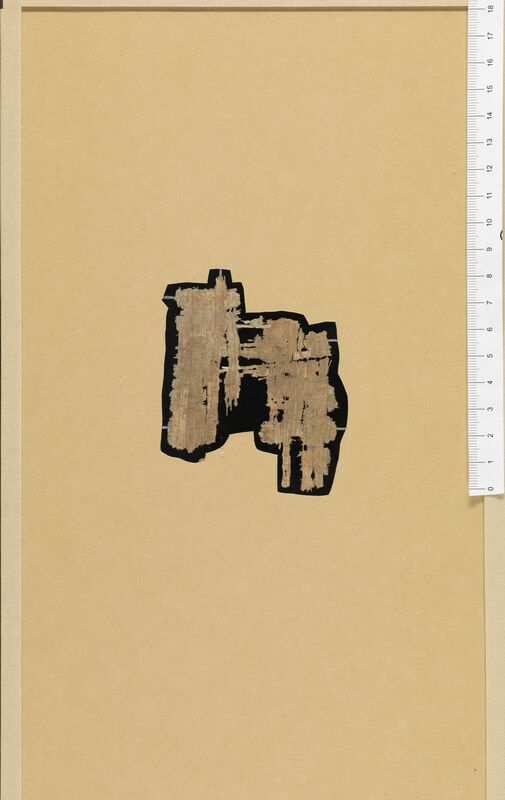 And in fact, this piece is probably the item that was described as a papyrus fragment of the third century containing verses 45-48 of the first book of the Iliad in the 1947 catalogue of Bodmer’s collection. VolumeThe original dimensions of the roll cannot be determined. 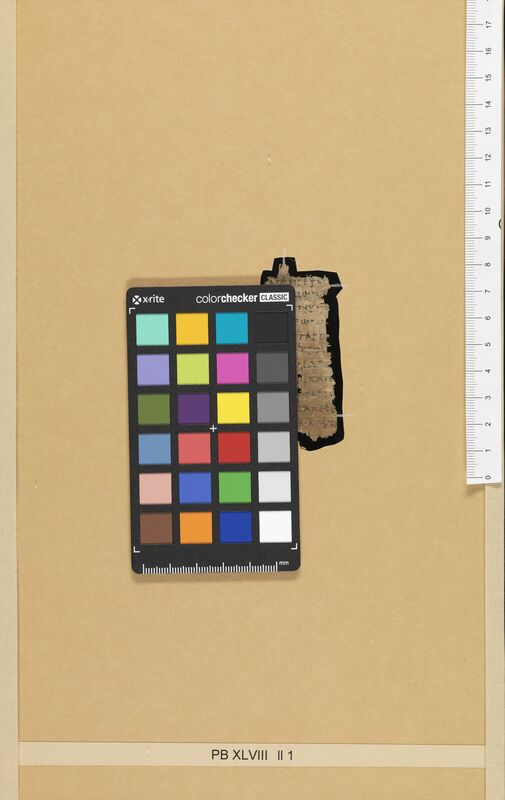 The present fragment is 8.2 cm high and 6.5 cm wide. The width of the written column is about 10 cm. Paratextual features: The text employs the diaeresis and apostrophe. Hurst, André. “Papyrus Bodmer 48: Iliade 1, 45-58.” Museum Helveticum 47 (1990), 30-33. Bodmer, Martin. Eine Bibliothek der Weltliteratur. Zurich: Atlantis Verlag, 1947.